When it comes to boozy American golf traditions, it always feels like the East has the market cornered. Which makes sense, in a way—people have been drinking and playing golf in tandem longer in the Northeast and the South than places west of the ol’ Mississipp. Why, back when linen-suited gentlemen were sipping sherry at the Savannah Golf Club in 1794, Lewis and Clark had yet to even embark on their western quest to find the country’s first In-N-Out Burger. And when Oakhurst’s mustachioed caddies started serving post-round pick-me-ups in 1884, Doc Holliday was still alive—albeit mildly tubercular—and happy to be Kurt Russel’s huckleberry. Or was it Kevin Costner’s huckleberry? Well, he was someone’s huckleberry. 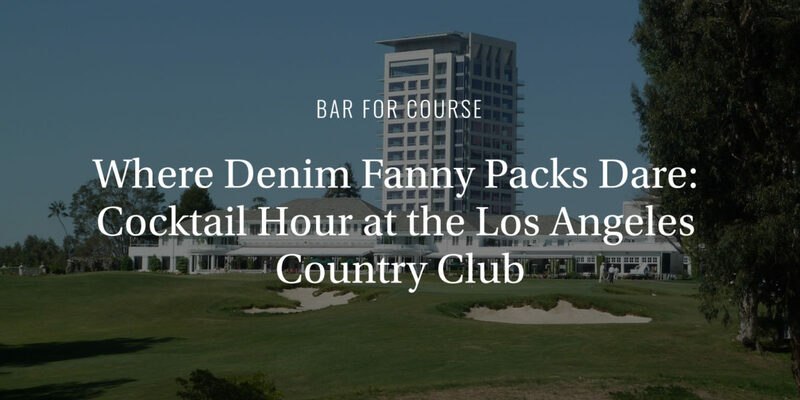 There are a few high-brow exceptions, however, when it comes to Western drolfing (yes, that’s a portmanteau for drinking and golfing) and one can easily find them at the Los Angeles Country Club—a club first formed way back in 1897, in the base of an old windmill, as a matter of fact. These days, the clubhouse has upgraded slightly from the old mill on Alvarado to its gleaming white abode in Beverly Hills, but they’re still sticklers when it comes to tradition, from their strict “no denim of any kind” rule (and yes, we checked, even our Jordache fanny pack is verboten), to their preference for local West Coast fare. Including, as it happens, the Moscow Mule. At the L.A.C.C., no round is complete without tossing back at least a couple of these classic Los Angeles cocktails out on one of its many porches—and if you ever have the chance, we strongly suggest you do the same. The frosty libations are generally served in a chilled copper mug so cold it stings your hand, and with plenty of icy ginger beer and vodka to boot—a sports drink, you might even say, for the sport coat set. Because while folks on the west coast claim to be health conscious, we all know that’s total bullsh*t. Lewis and Clark discovered In-N-Out Burgers galore, Val Kilmer probably chases his huckleberries with Pinkberry, and denim fanny packs or no denim fanny packs, those Angelinos can definitely drolf with the best of them.